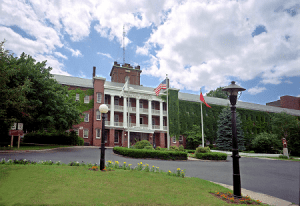 Founded in 1967, STCC is located on 35-acres of the Springfield Armory National Historic Site and is a major resource for the economic vitality of western Massachusetts. As the only technical community college in Massachusetts, STCC, an Achieving the Dream Leader College, offers a variety of career programs unequalled in the state. STCC’s highly regarded transfer programs in business, engineering, liberal arts, science and technology continue to provide the most economical option for students pursuing a four-year degree. With an enrollment of evening, weekend, and online students, STCC is a vibrant campus rich in diversity. At 2nd light turn left onto State Street. Turn left into Springfield Technical Community College’s main gate.